Based on the film, Ham III, grandson of the first chimpanzee in space, teams up with fellow space-mates Luna and Titan to a space adventure and trip to an unknown extraterrestrial planet. Which the player plays two characters, Ham and Luna, through levels defeating enemies in order to defeat Zartog and save their friend, collecting the color gumdrop-shaped objects call Globtrotters as well as Bananas which would allow the players to access extras such as character concepts, artwork and videos. The game received mixed reviews, though it received higher scores than most games based on children's movies. IGN gave the Wii and PlayStation 2 versions 6.5, the Nintendo DS version 6.6 and the PC and Xbox 360 versions 6.7. 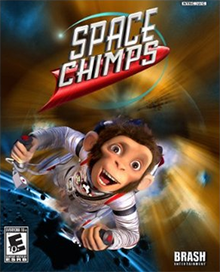 ^ "Search Results for "space chimps game" - IGN". Retrieved March 21, 2011. This page was last edited on 4 April 2019, at 19:21 (UTC).